Refrigeration-Building Operations, Maintenance & Recordkeeping (R-BOMR) – NY Fire Consultants Inc. This is a required New York City Fire Department (FDNY) course for the Q-01 and Q-99 Certificate of Fitness renewal. It consists of a 7 hour of instructions followed by a exam. Certificate of Qualification (Q-01/Q-99) which expires on or after January 1, 2016, the applications for renewal must submit evidence of having completed BOMR course taught by an FDNY approved school or a valid FSD (F58/F25) Certificate of Fitness. Rules of City of New York requires that all Refrigerating System Operating Engineers (RSOE) must complete a continuing education course in building operation, maintenance and recordkeeping from a Fire Department-approved continuing education program. This training course shall, at a minimum, provide not less than seven (7) hours of live instruction. This will ensure that operating engineers, who typically have other important responsibilities relating to building operation and maintenance, are familiar with applicable Fire Code requirements, which have undergone a comprehensive revision in 2008 and were revised again in March of 2014. This course is required of all Certificate of Qualification holders, including those that may currently not have a work location registered with the Fire Department. All Certificate of Qualification applications for renewal on or after January 1, 2016 must submit evidence of having completed such course. Refrigeration system operating engineers (RSOE) that are knowledgeable in Fire Code building operation and maintenance requirements will help foster compliance with the Fire Code in the buildings where they are employed, thereby making the building a safer place for occupants and emergency responders. 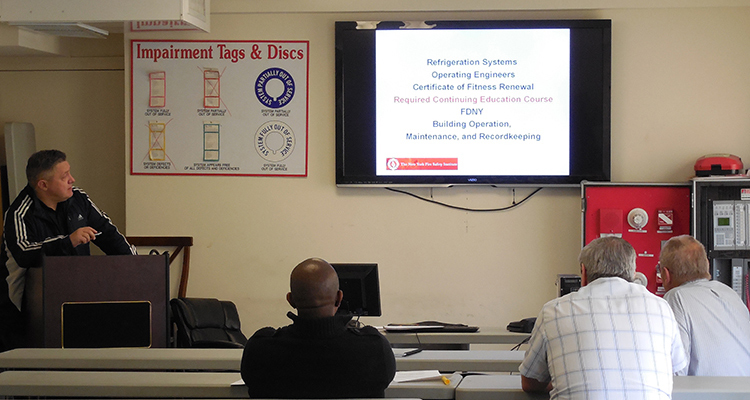 Download the FDNY Notice of Examination, which includes the procedures and requirements related to renewal of a Certificate of Fitness for Refrigeration – Building Operations, Maintenance & Recordkeeping personnel. All classes are taught at The NY Fire Safety Institute, in Suite 618 Wyndham New Yorker Hotel, Suite 618 (8th Avenue at West 34th Street). See below for directions. Classes are scheduled as needed. Call 718-432-1600 for availability.